From Amazon: Jaroslav Pelikan, widely regarded as one of the most distinguished historians of our day, now provides a clear and engaging account of the Bible’s journey from oral narrative to Hebrew and Greek text to today’s countless editions. Pelikan explores the evolution of the Jewish, Protestant, and Catholic versions and the development of the printing press and its effect on the Reformation, the translation into modern languages, and varying schools of critical scholarship. "Whose Bible Is It?" is a triumph of scholarship that is also a pleasure to read. 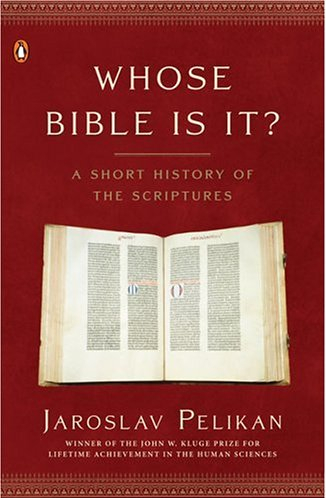 “An engaging and highly readable survey of biblical scholarship that tells a fascinating and complex story.” "—The Wall Street Journal"
“A crisp, remarkably succinct history of the Bible as preserved, interpreted, translated and canonized by the various faiths that believe in it.” "—Los Angeles Times"
“Engaging . . . an excellent overview.” "—The New York Times Book Review"
“Masterly . . . Pelikan weaves a tapestry of the power of the Word to mold religious communities, nations, and culture. . . . Engaging, concise, and highly readable.” "—The Christian Science Monitor"